“Dr Ehrlich’s Magic Bullet” is a film you’ve never seen. It stars Edward G. Robinson in a different role than his characteristic gangster; he portrays instead a doctor seeking a cure for syphilis. When public funding for his research is withdrawn, a wealthy member of the nobility steps in (also played uncharacteristically by Maria Ouspenskaya, whom you’ll recall as the wizened gypsy woman cradling the head of Lon Cheney as the dying werewolf: “At last you have found rest, my son,” she intones with a thick eastern European accent). Ehrlich’s work is successful and an effective treatment for syphilis became available. Just when we imagine a particular disease may be under control, others reemerge that were thought to have been eliminated. Headlines this morning, for example, hint at a strain of gonorrhea resistant to antibiotics. All of this brought to mind the school nurse I had known in grades three through six: Miss Robina Lyle. If public health is an under-represented topic in Agincourt, Miss Lyle might offer a solution. When i was nine or ten — shortly after Marge departed — I recall an especially pesky bout of stomach flu. Miss Lyle, ever compassionate, suggested that I be sent home, and one of the teachers was enlisted midday to drive me the mile and a half. Curious whether any biographical information could be found, her memory lives on, even if her former charges are rapidly dying off: an elementary school in District #217 bears her name. Yet biographical material is still very thin. And ancestry.com reveals only one exciting fact: she was Canadian born in 1894 and emigrated to Chicago early in her career. Sadly, I cannot recall her appearance; yet the starched white sterility of her uniform is a vivid recollection. And her glasses on a chain draped across an ample bosom. 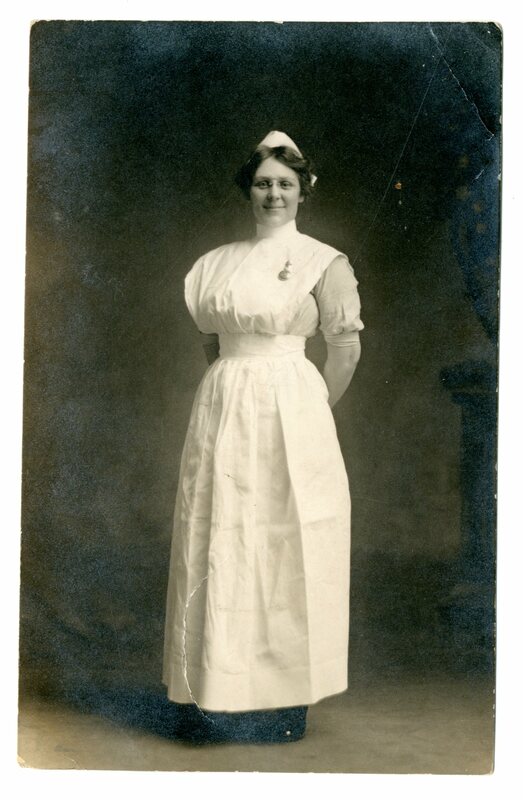 PS: This postcard shows a your nurse identified only as Ada. In honor of my Robina Lyle, I think our character will become Ada Lisle. Is that O.K. with you? By agincourtiowa in Ghosts of Christmas Past, Uncategorized on Thursday/31/December/2015 .